Westell’s comprehensive set of products enable communication service providers, cell tower operators, and other network operators to reduce operating costs and improve network performance. With millions of products successfully deployed worldwide, we transform networks into high-quality, reliable solutions. 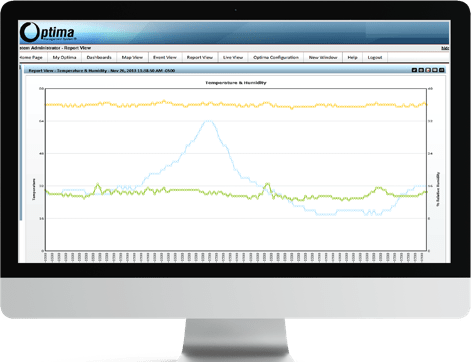 The Optima Management System® provides comprehensive site monitoring, management and control of a network’s site infrastructure from a user’s desktop and virtually any Apple® iOS and Android device. This gives immediate operational cost reductions for organizations that need to access, monitor and manage a large number of sites. View Westell's selection of Ancillary in-building wireless products. Westell offers a line of Antennas and their corresponding hardware to support in-building wireless communications. Directional Antennas are offered for external base station connectivity and omnidirectional distribution Antennas are offered for internal aggregation and distribution. Westell's Antennas are available with various gain levels and directivity options depending upon the specific application requirements. Westell's In-building Distributed Antenna System (DAS) RF Conditioner products optimize network performance. DAS RF Conditioners provide the flexibility to suit a variety of system requirements and future expansion. These products are available in both active (aka UDIT) and passive (aka DIU) models and are capable of covering single service provider, neutral host or multicarrier systems. Westell's standard coaxial Directional Couplers feature low insertion loss and power handling capability of 100 watts average power. Standard connectors are type N with other types and higher power levels are available upon request. Passive DAS interface trays are designed to simplify the connection of a BTS or repeater to a DAS. System components (aka passive devices) are utilized as part of a distributed antenna system (DAS) to direct the energy flow for specific frequency bands. Westell offers an extensive line of standard components as well as PIM-compliant components to meet a variety of DAS requirements. These passive components are available in multiple port configurations, power options, and connector types. View our system components specifically designed for Public Safety. Westell's complete solutions for enterprise voice, data, and industrial IoT. View Westell's Intelligent Site Management Solutions for system integration and installation. Westell's Site Management Devices, part of the Intelligent Site Management Solution, extend intelligence beyond existing boundaries by enabling management of critical remote locations from anywhere within the network. View Westell's Site Management Accessories for the best in intelligent monitoring and management. Westell offers a complete line of Copper/Fiber Management products for terminations and hand-offs. Fiber termination assemblies provide efficient all-in-one fiber terminations, connections and slack storage. Westell's VirtualEdge® products include secure access enclosures for Ethernet hand-off, as well as panels that provide a standard interface for a variety of Ethernet/Gigabit and DS3 services. When introduced more than 20 years ago, the Westell SmartJackTM became the industry standard for Network Interface Units (NIUs). Today, Westell offers a complete line of products for SONET/TDM applications. Westell has provided outdoor cabinets and enclosures for more than 20 years. Built to strict compliance standards, including NEMA-4, these secure, weather-tight cabinets will withstand harsh climatic conditions such as rain, snow, sleet, high winds, ice, and sand storms. Westell offers an extensive line of fuse panels for secondary and primary power distribution. View Westell's line of Repeaters including T1 Repeaters for your Communications Network Solutions needs. Westell’s highly reliable TMAs optimize LTE radio access networks by expanding a cell site’s coverage area, increasing site capacity, and improving the user experience.